Been using phpStorm now for a month solid 8 horus a day everyday for my work and am very impressed. After using ReSharper for years as a .NET dev. 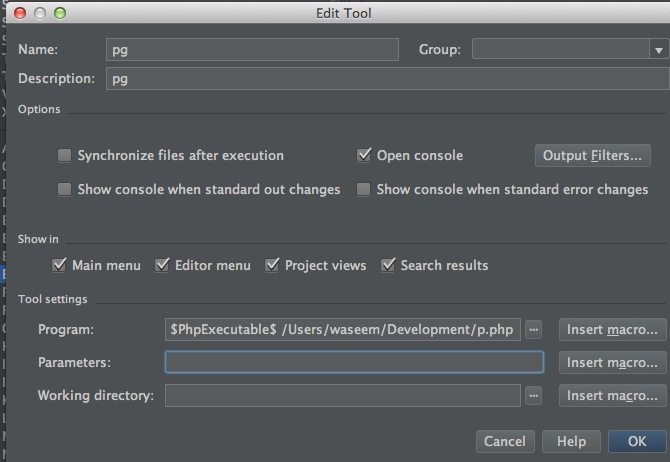 php /path/to/php/file.php (this works if i type it into the command line console in phpStorm). How did you setup your External Tool entry? A screenshot would be good (extrenal tools entry; the error; ect). Please see the images below.. As i said if I run for this example the simple command. I get the output of the php file which is just the text "test"
As I suspected you are doing it wrong. The Edit External Tool screen (the one on your screenshot) has separate fields for program and parameters -- use both of them -- they are there for a reason -- do not put whole command in "program" field. Create bash script in /usr/bin called "dophp"
For what I needed this all worked. There were some failed attempts using the .profile file in Mountain Lion (mac) .. and setting my dophp in there as an alias of the php command. From normal terminal this worked fine. But from within phpStorm it did not recognize the dopage command untill it was in a script in /usr/bin . Hope this helps someone else out there maybe. PhpStorm may simply not see some environment configurations/parameters (cannot find the better word right now, sorry) if they applied to *terminal only* (e.g. .bash_profile or whatever those files are -- sorry, I'm not a Mac user). That's why (one of the reasons) some functionality (e.g Run/Debug Configurations; File Watchers) have "Environment variables" field. Have a look at comments in this thread (for example), starting from this one: it should explain most (if not all) of it. You may file a bug report to the Issue Tracker if the above does not work (using full paths). I will try what you said .